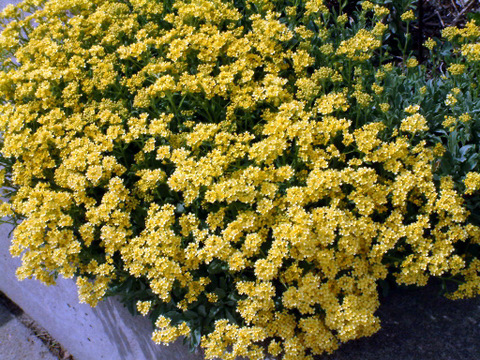 Basket of Gold is a long-lived, low maintenance ground cover for small spaces. Gray, slightly fuzzy leaves are present year round, forming clumps 6 to 18 inches tall and 6 to 12 inches wide. In early Spring the plants are totally covered with masses of tiny cross-shaped flowers. Eye-catching colors range from soft yellow ‘Citrina’ or ‘Dudley Neville’ to the blindingly intense golden yellow of ‘Gold Dust.’ A similar species, Mountain Gold (Aurinia montanum) is more compact, with smaller leaves. Mountain Gold is also a bit harder to find at a garden center. Cupid’s Dart comes to Colorado from Europe, where its historical role as an ingredient in love potions gave rise to its common name. Clumps of slender gray-green leaves grow about a foot tall and wide. Wiry stalks extend past the foliage, supporting a myriad of striking periwinkle-blue flower heads, each set off by papery bracts behind the petals. 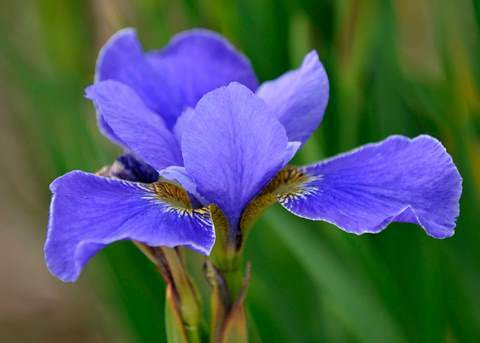 If left to mature, the two inch blooms turn into attractive seed heads that last all winter. If you live here, this isn’t exactly news. The fields are turning brown months early, wildflowers are small and sparse, and even the most aggressive weeds are wilting. 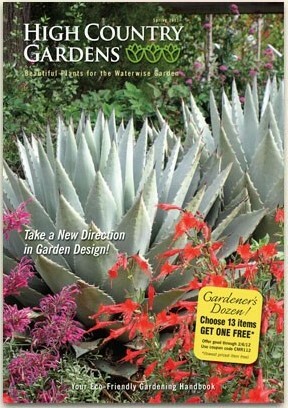 Successful gardening in Colorado means choosing plants well suited for our arid climate. 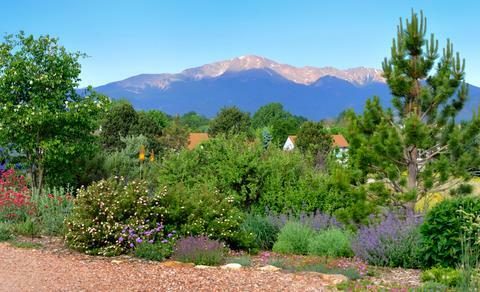 Colorado Springs Utilities (CSU) maintains two demonstration gardens, featuring beautiful perennials, grasses, shrubs and trees that are adapted to limited irrigation. Many people are aware of the large garden at the CSU headquarters on Mesa Road, overlooking Garden of the Gods. I wrote about it in April. But very few people are aware that there’s a second, smaller garden in front of the Cottonwood Creek Recreation Center at 3920 Dublin Blvd., just west of Rangewood Drive. While much more limited in scope, this garden provides plenty of inspiration for a homeowner seeking to conserve water and still enjoy a beautiful landscape. When I visited in mid-June, a large swath of Stella ’d Oro daylilies were in full bloom, their bright golden yellow accented by the soft lavender of the surrounding Walker’s Low Catmint. The colors were repeated in lovely deep blue irises, purple Jerusalem Sage, and pastel yellow Moonshine Yarrows and Pineleaf Penstemon.